Written by Hotel Korpikartano on 19/11/2016 . Posted in Blog. Hotel Korpikartano is situated nicely in the middle of nature and far away from street lights and city or village lights, so no light pollution. That means ideal place for aurora watching and aurora photo shooting. 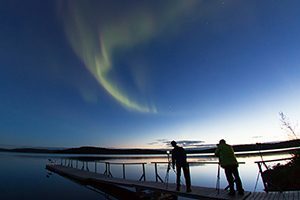 Our season for Northern Lights is long and first time we usually see aurora in the end of August, this year already on 19th August, then it is dark enough during the evening or night. And last possibility is on 12th April, sometimes on 13th April, after then it is too light already. Autumn time is ideal for guests who are not so keen on snow or cold. Also Northern Lights look great when reflecting from surface of Lake Menesjärvi before it gets frozen in November. 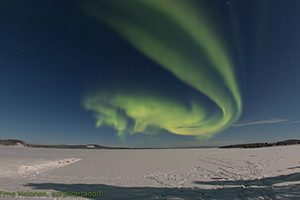 During winter a good area for shooting auroras is on Lake Menesjärvi, only 2 minutes from the hotel main door! So in Korpikartano no need to hunt auroras or no need for transfers either! Also the nearby forest can give nice scenery under auroras. Good time on our latitude is from 8pm until 2am. Earliest we have seen 4pm and latest 7am! We often say that when you can see stars, sky is clear enough to see northern lights when the sun is active enough. 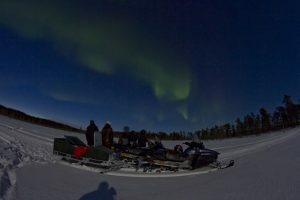 Sometimes the activity is so high that aurora reflects trough thin clouds or can be seen in windows, holes between clouds. Either you need not to be worried about full moon, as often then activity of the sun can be high and then aurora also very much visible as well. Most photographers come to our hotel with aps-c body, so the tips are for that. 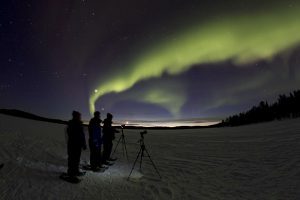 Northern lights can fill the whole sky, so the lens is an issue. Our rental lenses are Samyang 8mm f3,5 which are good as multipurpose lenses. If you have a p&s camera, it may also work fine, just make sure that you can use high ISO, between 800-1600 and long timing, up to 15-20sec. Tripod is a must, heavier the better but whatever helps. In our hotel we have a few to borrow.